What is Disaster Unemployment Assistance (DUA)? Disaster Unemployment Assistance (DUA), also referred to as Disaster Relief and Emergency Assistance, is a federal program that provides temporary financial assistance to individuals unemployed as a result of a “major disaster” declared by the president. A major disaster declaration due to historic Midwest flooding was issued by FEMA on March 21st for portions of Nebraska. On March 23rd, a major disaster declaration was issued for portions of Iowa. Nebraska: On March 21, 2019, a major disaster declaration was issued by FEMA designating the following counties eligible for individual disaster assistance: Butler, Cass, Colfax, Dodge, Douglas, Nemaha, Sarpy, Saunders, and Washington counties. On March 27th, Nebraska’s Department of Labor announced the availability of DUA benefits in those nine designated counties, and that the deadline to file a DUA application in those counties is April 26, 2019. On March 31st, FEMA designated the additional Nebraska counties of Boone, Buffalo, Custer, Knox, Richardson, Thurston, and the Santee Sioux Nation for individual disaster assistance, and Nebraska’s Department of Labor announced the availability of DUA benefits in those additional counties, where the deadline to file a DUA application is May 3, 2019. On April 13th, another twelve counties in Nebraska were added to the major disaster declaration as eligible for individual assistance, and the state Department of Labor announced the availability of DUA benefits in Antelope, Boyd, Burt, Cuming, Hall, Howard, Madison, Nance, Pierce, Platte, Saline, and Stanton counties, where the deadline to file a DUA application is May 13, 2019. Iowa: On March 23, 2019, a major disaster declaration was issued by FEMA designating the following counties eligible for individual disaster assistance: Fremont, Harrison, Mills, Monona, and Woodbury counties. On March 26th, Iowa’s Department of Workforce Development announced the availability of DUA benefits in those five designated counties, and that the deadline to file a DUA application in those counties is April 25, 2019. On April 17th, Iowa’s Department of Workforce Development announced the availability of DUA benefits in Pottawattamie and Shelby counties, and that the deadline to file a DUA application in those two additional counties is May 17, 2019. For a current list of the states and counties covered by disaster declarations, see FEMA’s website (http://www.fema.gov/disasters). What are the Basic Eligibility Requirements for DUA? There are two major requirements for an individual to qualify for DUA: 1) The individual must be out of work as a “direct result” of a major disaster; and 2) The individual does not qualify for regular unemployment insurance (UI) from any state or U.S. territory. Once found to be eligible for DUA, workers must actively look for work and accept suitable work offered them, not unlike UI recipients. In addition, the individual must show that for every week he or she is collecting DUA, his or her unemployment continues to be the direct result of the disaster, not other factors. How Much Are DUA Benefit Payments? Like regular state unemployment insurance (UI) benefits, federal DUA benefits are paid weekly, once an application is completed, filed and processed. Generally, DUA recipients receive the same weekly benefits that they would have been entitled to had they qualified for UI in the state where they were employed. However, at a minimum, DUA benefits cannot be less than one-half of the state’s average weekly UI benefits (see the state maximum and minimum DUA benefit levels below). The DUA benefits for part-time workers are pro-rated based on the hours they worked as a percent of a 40-hour work week. Note that DUA benefits are reduced by any other wage-loss compensation, including private insurance, Supplemental Unemployment Benefits, worker’s compensation, and a pro-rated amount of a retirement pension or annuity. How Long Will an Individual’s DUA Benefits Last? The maximum duration of DUA benefits is 26 weeks. However, an individual’s benefits cannot extend beyond the period when the disaster officially ends, which is six months from the date of the federal major disaster declaration (unless the deadline is extended by Congress). In addition, the DUA benefits cannot extend beyond when the recipient returns to work or self-employment or beyond the period when the individual’s unemployment is no longer directly related to the disaster. What are Some Major Examples of Individuals Who Can Collect DUA? People who are scheduled to start work but became unemployed because they no longer have a job as a direct result of a disaster. In addition, workers may collect DUA if they have reached the end of their regular state Unemployment Insurance (UI) benefits and are still unemployed as a direct result of the disaster. Are Workers Who Did Not Work in the Disaster Area Also Eligible for DUA if Their Unemployment Was Still Directly Caused by the Disaster? There are limited situations where workers outside the disaster area can qualify for DUA if they were laid off due to their employer’s loss of substantial revenue from contracts with businesses located in the disaster area. However, according to the federal regulations, the employer or self-employed individual must have received at least a “majority of its revenue or income from an entity that was either damaged or destroyed in the disaster.” In addition, the individual must continually establish that his or her unemployment remains directly related to the major disaster. What Are the Deadlines to Apply for DUA? What Information is Necessary to Verify an Applicant’s Work and Earnings? Where Can an Individual Apply for DUA? Each state may process DUA somewhat differently. Most states will process applications by telephone, as part of their automated claims-taking process for regular state UI benefits, and online via the Internet. In Nebraska, workers and self-employed residents are urged to go to https://dol.nebraska.gov/UIBenefits to file a claim or call the unemployment claims center at 402-458-2500. In Iowa, workers and self-employed residents are urged to go to https://uiclaims.iwd.iowa.gov/UIInitialClaim/ or call 1-866-239-0843 from Monday – Friday, 8:00am – 4:30pm. For the latest information on how to file for either DUA as a result of the 2019 Midwest floods, or for regular state UI benefits, we recommend that individuals regularly check the state unemployment insurance agency websites listed below. Are agricultural workers eligible for state unemployment benefits? Yes, many farmworkers may be eligible for state unemployment benefits. If a farmworker does not qualify for state unemployment insurance (UI) benefits due to failing to meet the state UI earnings requirement, the farmworker may qualify for Disaster Unemployment Assistance (DUA). Are immigrant workers eligible for state unemployment benefits and federally-funded Disaster Unemployment Assistance? Generally, workers who have work authorization both at the time that they were working and while they collect benefits may qualify for regular state unemployment benefits and DUA. Individuals who are not U.S. citizens must present documentation supporting their immigration status, and the State UI agency must verify their status through a government process called Systematic Alien Verification for Entitlement Program (SAVE), administered by US Citizenship and Immigration Services (CIS). 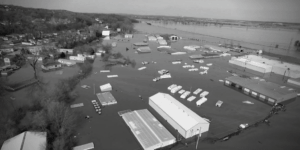 What Additional Services and Resources Are Available to Workers and Families Impacted by the 2019 Midwest Floods? In addition to DUA, the federal government is funding a range of services for workers and families impacted by the Midwest flood disasters. Information about Disaster Food Assistance Programs, including Disaster SNAP (food stamps), is available at the Department of Agriculture’s Food and Nutrition Service website (https://www.fns.usda.gov/disaster/disaster-assistance). For more information on federally-funded services in your area, refer to FEMA’s Federal Disaster Assistance website (https://www.disasterassistance.gov/). NELP’s guide to Worker Health and Safety During Cleanup and Recovery From Hurricanes (https://www.nelp.org/publication/worker-safety-cleanup-recovery-hurricanes/). For more information on workforce programs and labor protections, refer to the U.S. Department of Labor’s Severe Storm and Flood Recovery Assistance website page (https://www.dol.gov/general/stormrecovery). Information on availability of disaster assistance for non-citizens and mixed-status families is available on FEMA’s website (https://www.fema.gov/news-release/2015/06/29/frequently-asked-questions-disaster-assistance-noncitizens). Information on eligibility of disaster assistance for families with members who are not U.S. citizens is also available from the National Immigration Law Center (https://www.nilc.org/wp-content/uploads/2015/11/disasterassist_immeligibility_2007-062.pdf). The National Employment Law Project is a non-profit organization that advocates for unemployed workers. The information provided with this fact sheet is based on the best resources we have available on the DUA program. However, it should not be relied upon as source of official government information on the DUA program.